Parents often ask me, "How much does homeschooling cost?" The cost of home education varies according to a family's needs and desires. Some of the costs associated with homeschooling are curricula, school supplies, support groups, legal association dues, and my favorite - books. 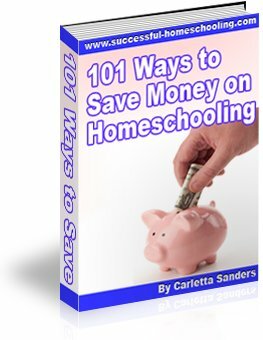 Resourceful families can find many ways to lower their homeschooling cost. Families who educate more than one child at home often spend less money per child as they are able to reuse and share resources. According to these homeschool statistics, children whose parents spend very little on home education fare just as well as those whose parents have spent a great deal on materials. Before you make a purchase, ask yourself, "Do I really need this?" If yes, ask, "Is there a lower cost option available?" Your children don't need a health curriculum to learn to brush their teeth. Other subjects like history and science can be taught using library books. Take advantage of your local library. Don't hesitate to use interlibrary loan or ask the librarian to purchase materials. Be sure to return the books on time! Share with friends. Join another family once a week for science, art or music, and share the cost of the program. Buy one program for the entire family in subjects like Bible, science, history, art and music instead of buying separately for each child. If necessary, add in more difficult material for older children or simpler materials for younger children. Think long-term. Buy high quality materials that you can hand down to younger children. When using consumable workbooks, have your child work on a separate paper, or cover the worksheets with page protectors and use overhead markers. Take advantage of back to school sales at local stores and stock up on notebooks, paper, pens, pencils, crayons, markers, glue and other inexpensive supplies. Here's a list of stores that offer homeschool discounts. Make your own lesson plans, flashcards, games and manipulatives. You can also make your own tests instead of purchasing pre-printed test booklets and answer keys. Take lessons and classes from other homeschool parents who may offer a discount. Also consider bartering or trading services. You could teach art for another homeschool mom and have her teach your children music. Ask your favorite field trip destinations if they have a free or discounted admission day. If they offer group discounts, gather some friends and make it a group outing. Take advantage of free field trip opportunities at police and fire stations, restaurants, the post office, and pet shelters. Nature walks in the park are great for teaching science.